This chapter proposes a neural network based approach for solving the resource discovery problem in Peer to Peer (P2P) networks and an Adaptive Global Local Memetic Algorithm (AGLMA) for performing in training of the neural network. The neural network, which is a multi-layer perceptron neural network, allows the P2P nodes to efficiently locate resources desired by the user. The necessity of testing the network in various working conditions, aiming to obtain a robust neural network, introduces noise in the objective function. The AGLMA is a memetic algorithm which employs two local search algorithms adaptively activated by an evolutionary framework. These local searchers, having different features according to the exploration logic and the pivot rule, have the role of exploring decision space from different and complementary perspectives. Furthermore, the AGLMA makes an adaptive noise compensation by means of explicit averaging on the fitness values and a dynamic population sizing which aims to follow the necessity of the optimization process. 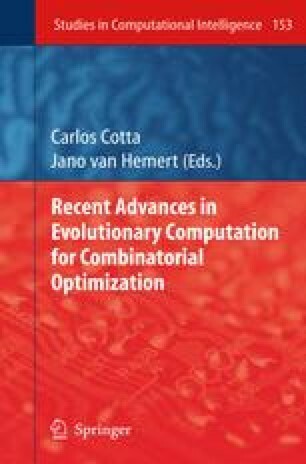 The numerical results demonstrate that the proposed computational intelligence approach leads to an efficient resource discovery strategy and that the AGLMA outperforms an algorithm classically employed for executing the neural network training.